Today was the first day of Rush Academics. For me it started last night as I continued to do the last minute things to assure everything was in order. After reading and studying I finally managed to climb in the bed at around 1:30 a.m. just to find out I was completely restless until about 3. my punishment for this late night partying fiesta; I overslept. I didn’t wake up until 7:30 because I kept hitting the snooze button on my alarm from 5:15. So, not only did I wake up late for school, I also missed my morning worship and empowerment call. Never-the-less I did get started with our day, just later than I had anticipated. Since I didn’t wake up early enough to get started the way I planned, I decided to forgo the entire plan for the day and make it and easy first day. We packed up and went to the Firehouse Museum in Tanger where we learned the importance of fire safety and exit strategies. 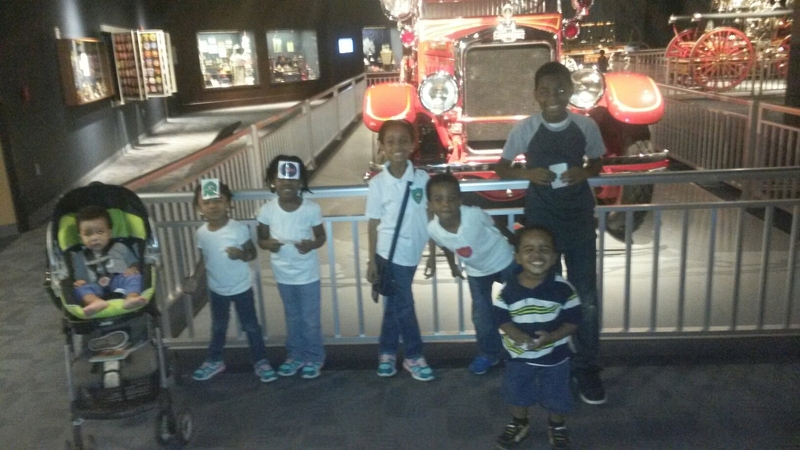 we a lot toured the museum and got to view and learn about fire trucks dating back to 1857. The children were able to make their own badges, take pictures and ride in a fire truck simulator. When we came home we just did some refresher work. The littles worked on phonics, alphabet recognition, rhyming, and manners. I figure tomorrow we will get a little more structured, as planned and increase in difficulty there. I have to say, not shabby for our first day, I was able to learn some new things along with them which was nice. The best part is, Biz, whom absolutely LOVES going to school told me she loved homeschooling. That was nice. The best part is that I am able to freely implement a Christian base to their academics. Todays focus is Daniel Chapter 1. Once I find our rhythm I will post our schedule for those who are wondering. Tomorrows morning trip will be to Wannamaker Park, we have a homeschooling play date! Now as the children wind down and I finished cooking dinner, I am working on a clients social media package. Yes, you know I stay busy!